Half of the parents of 11 to 16 year olds could not say where their children are outside of school hours, says a report on "home alone" teenagers. The report from childcare charity 4Children, and Labour MP Karen Buck, calls for improvements in after-school facilities for teenagers. A third of young people at secondary school go home to an empty house when lessons are over, says the report. The government said it was investing significant sums in childcare services. In 77% of families with children of this age, both parents are working. Such unsupervised youngsters, without access to youth clubs or creative activities, are at risk of involvement in crime, says the report. The report highlights the lack of childcare or activity places for secondary school age children - with only one place for every 200 such youngsters. Ms Buck says "there is still an alarming shortfall in provision for older children". It means that 650,000 children return to an empty home - where they either wait until a parent returns from work or else let themselves out to meet other youngsters. "With little after-school support available for children of 11 to 14 and research showing this is a time when children can go off the rails, it seems unfair that parents are often left to juggle the difficult balance between work and their family life unaided," says Anne Longfield, chief executive of 4Children. "We know that at this age children want a different sort of care and our proposals set out the stall for this 'next generation' care for older children." The report once again raises the issue of a lack of involvement of adults in the lives of their children - and warns that gangs of youngsters left to their own devices will be at risk of "isolation, boredom and temptation into crime". "At any one point in time half of parents do not know exactly where their teenagers are, whom they are with or what they are doing when they are not in school," says the report. There have been warnings from teachers' unions conferences that the "long-hours culture", in which parents spend long days at work, can be damaging for children's social development. 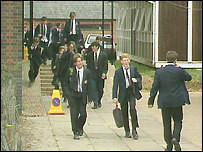 A spokesman for the Department for Children, Schools and Families said there were now more than 8,000 extended schools. "We have also learnt that there are more full day care places, after school club and holiday club places than ever before. "Extended services are popular with parents and children and can help to put schools at the heart of their communities. "They provide excellent opportunities for children to take part in fun activities and boost their confidence," he added. A survey from the Institute for Public Policy Research last year concluded that Britain's teenagers were among the worst-behaved in Europe - in terms of drugs, alcohol and violence. And it concluded that a substantial factor was the lack of family life in Britain - with many teenagers much more likely to influenced by their peer group than their parents or other adults. The institute says young Britons are marked out by how they spend their free time. In England, 45% of 15-year-old boys spend most evenings out with their friends, and in Scotland the figure is 59%. In France just 17% of boys spend their time in the same way.